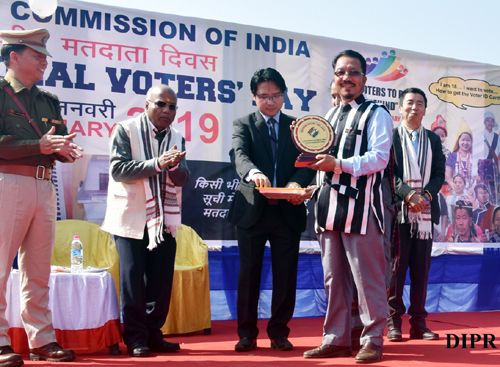 Arunachal Pradesh celebrated the 9th National Voters’ Day along with the rest of country on Friday. In order to encourage more young voters to take part in the political process, the Government of India has decided to celebrate January 25 every year as “National Voters’ Day”. The day also marks the founding of Election Commission of India. Yupia: The celebration which was organized at the New Urban Shopping Complex was graced by Chief Secretary Satya Gopal and Chief Electoral Officer (CEO) Kaling Tayeng as chief guest and guest of honour respectively. Addressing a large gathering, the chief secretary while highlighting the importance of the day informed that this year a total of 35286 voters aged 18-19 have been added to voters list with overall increase of 2.75 percent in the state. He also said that CEO’s office under the leadership of Tayeng has done a great job in organizing Chunav schools in all polling stations besides creating voter’s awareness forum and spreading awareness on electronic voting machines and voter-verified paper audit trails. Gopal also informed that a toll free voter’s helpline (1950) and voter’s verification and information programme have been launched for the country which will help in conducting a free, neutral and peaceful parliamentary and assembly elections. Seppa:The East Kameng district election office celebrated the day at the crowded crossroads of Seppa Bazarline. A colourful street show, which may be touted as a novelty for a government-sponsored programme marked the special occasion. Besides array of formal events like the launching of helpline number- 1950, distribution EPI Cards to newly enrolled electors, administering of the Voters’ Pledge, the day also saw the best performing booth level officers and winners of literary competitions being awared. Earlier in the programme, deputy district election officer Dahey Sangno launched the helpline and toll free numbers to enable registration of all E-Roll related grievances. He also explained the public on how to go about registering their grievances using the helpline numbers. Bomdila:National Voters Day was celebrated at Buddha Peace Park here with the theme ‘No voter to be left out’. Urging the people to elect the right person by using the constitutionally guaranteed right to vote, MLA Japu Deru opined that voter’s education is not only the correct but also the most appropriate way to improve participation in a democracy. Targeting the prospective voters, West Kameng deputy commissioner Sonal Swaroop urged the youths to enroll oneself as and when they come of age and be a partner in nation building. She called on the voters to uphold the democratic traditions and the dignity of free, fair and peaceful elections. Besides distribution of new PVC EPICs to the newly enrolled voters, the winners of quiz, drawing and essay writing competition held in all the schools under Bomdila Township to commemorate the celebration were felicitated by the DC, SP and ERO. A street play on ethical voting was also orchestrated by the students of Government College Bomdila on the occasion. Signature campaign on billboard and picture / selfie points with tag lines on election were some innovations of the celebration conceptualized by the SVEEP team. Tawang:The 9th National Voter’s Day celebration here was held the DC’s conference hall in which all the HoDs, administrative officers and booth level officers of the district participated. In his welcome address, EAC Lobsang Tsetan spoke on importance of National Voters day and activities of election department in creating awareness on importance of elections in democracy. Speaking chief guest ADC Bekir Nyorak sought active and advance planning from police and all the HODs for the upcoming election. The day was also celebrated at Tezu, Namsai and Aalo.